I had high hopes for this bank robbers film set in West Texas. Toby Howard (Chris Pine) and Tanner Howard (Ben Foster) are robbing branches of Texas Midlands Bank to get the money to pay off the reverse mortgage on their recently deceased mother's ranch. All they want is $43,000, so they can make low pressure robberies that don't even open the vault. 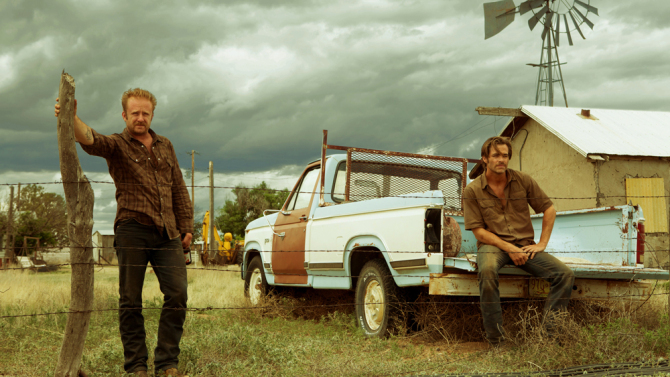 Hell or High Water follows both the brothers and their biggest obstacle: two Texas Rangers, played by Jeff Bridges and Gil Birmingham. All they have to do is narrow it down to which branch of Texas Midlands Bank will be hit next. I enjoyed the way the story twisted and turned, revealing more about the brothers' motivation and master plan as well as the work friendship between the Rangers. Both sets of partners are antagonistic but fond. West Texas is a very different place from where I live in Texas, but I know oil workers and they are hurting right now. Combined with the collapse of the housing market, many people have lost their homes. It's easy to see why even a lawyer might want to stick it to the banks, or why a waitress might be won over by a large tip. Yet something about Hell or High Water left me cold, despite the solid story and performances. It's perhaps too slick, and needs to take a bit of gritty inspiration from its setting. It's a good movie, but more one that might catch your attention when it comes on cable. But there's some missing element that keeps me from calling it great. Sorry it didn't quite have "it" but it does have an interesting premise.